Mehendi is one overy important indian wedding rituals followed in India by people from almost every faith and community. It's that time of your wedding when you get to pamper your hands with Mehendi while chatting and dancing with friends and family. Coming to the jewelry part, this function is where you get to experiment the most . Brides almost always turn away from their usual gold jewelry for mehendi and opt for unique stuff like gota accessory, lace jewellery or the very popular florals. Flowers have been a favorite for this occasion with majority of brides probably because brides want to keep it fresh and organic in tune with the mehendi theme . Floral jewelry also comes cheaper than your gold jewelry and the variety offered is simply amazing . You can use floral jewelry to up the visual interest of your mehendi and it will add a lot of colour to your event. If you are a creative person all you need is different kind of flowers to string up your own special jewelry by running your imagination wild but if you dont have time on hands just get them made from floral vendors in your city . For more colour in your mehendi look try contrasting flowers with your outfit. Wearing green lehenga? Then opt for sunny yellow flowers . If your outfit is blue contrast it off with bright pink flowers . This will look amazing in your photographs. Floral jewelery with beads are in trend these days, they look more sophisticated and elegant. See how this bride wore metallic gold beads with rose flowers. If too much of flowers aren't your thing then go in for just one statement floral accessory . 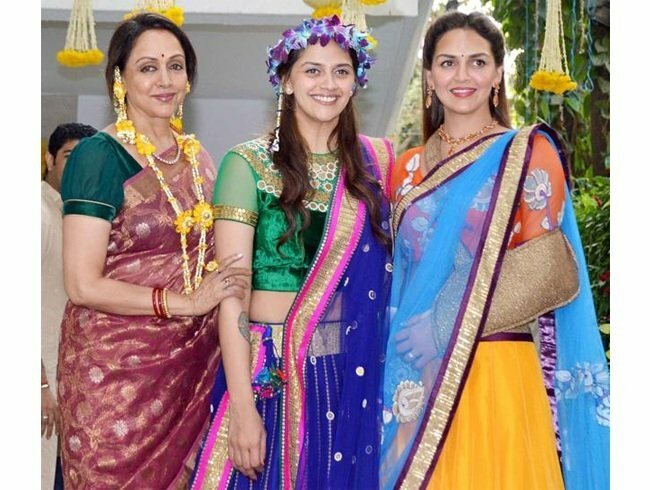 This works well if your outfit has a lot of colour in it, just add a single signature jewelry like the floral earrings this bride wore or the hair wreath Ahana deol wore. For a more funky or a contemporary look on your mehendi wear a deep back gown and accessorize your back with flowers.